Parents have their work cut out for them when it comes to packing healthy and kid-approved lunches. The bustle of morning craziness doesn’t lend itself to carefully crafted morsels. 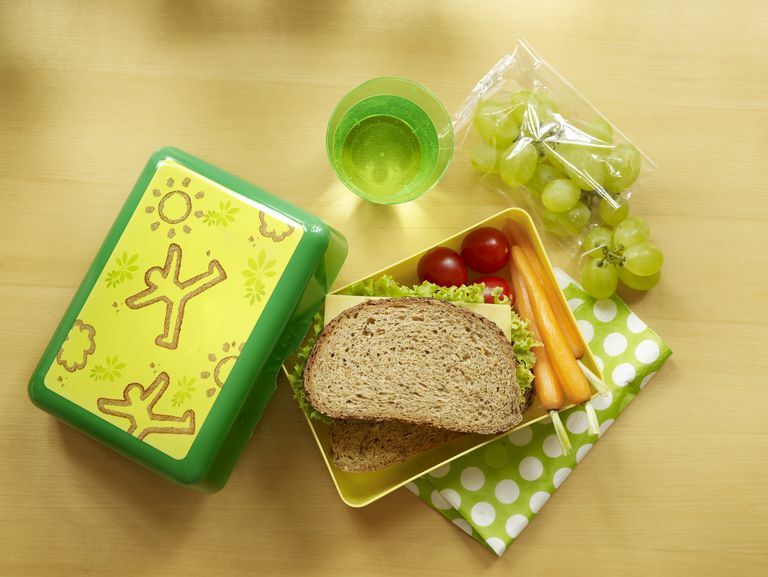 The lack of time and inspiration launches many parents into the same lunch box ruts. Here are six common missteps to a well composed packed lunch plus solutions and recipes to up your lunch game. The AM time crunch gets even more pressing when you’re asking repeatedly “what do you want for lunch….do you want this or this?…or this?” The desperation is palpable. Solution: Turn off the broken record and instead of leaving the lunch plan to the crack of dawn, sit down on Sunday evening and map out what to make for the week ahead. This takes only a few minutes and will pay off swiftly on busy mornings. You pack a milk box, yogurt tube, and cheese stick because you know your kid likes all three, but that doesn’t mean you want to jam them all in the lunch box. Overloading one food group means you are probably neglecting other healthy options. Solution: Aim for balance each day. Including just one serving of dairy along with other whole foods for the meal gives you more chances to introduce a wider variety of options the rest of the week. You don’t want to eat cold mac and cheese or a hot cup of pineapple, and neither does your child. Take a few simple steps to keep hot foods hot and cold foods nice and chilly. Not only is temperature control important for the way food tastes, it's also helps keep it safe from bacterial contamination. Solution: Invest in a good quality thermos to tuck into lunch boxes or try an all-in-one like the Omie Box. To keep hot food properly warmed until lunchtime, preheat your container. Fill a thermos with hot water for 10 minutes, then drain and fill with hot food. Solution: Amidor suggests a more balanced meal by substituting the tortilla chips for cut up veggies like carrots and red peppers that can be dipped into the guac or another dip. Kids can become less interested in meals when they are disconnected from the process. If lunch seems like a painful chore to you, your children will gladly subscribe to that thought process as well. Solution: Instead of the hounding questions about what to pack, ask the kids to use their imaginations and even get their hands dirty. Take some time on a day off to select and try easy recipes like tuna pasta salad and microwave tomato soup. Have them help prep the ingredients and then get tasting together. Instead of buying highly processed junk foods, make homemade versions of kid favorites like fruit leather with the kids. File the most popular recipes in your stockpile of family favorites and everyone will look forward to having them for lunch. In a large bowl combine both types of tuna, chopped celery, apple, lemon juice, and mayo; season with salt and mix well to combine. Toss tuna salad with cooked pasta. Enjoy immediately or store in the refrigerator for up to 3 days. Combine marinara sauce and chicken stock in a large microwave-safe bowl. Cover with plastic wrap and poke a few holes in the top to allow the steam to escape. Place in the microwave and cook on high heat for 3 minutes. Carefully stir and cook for an additional 2 minutes. Remove from microwave and stir in heavy cream. Serve with desired toppings. Preheat oven to 170 degrees F. Line a baking sheet with parchment paper or a nonstick baking mat and set aside. Place strawberries, kiwi, sugar, and honey in a medium saucepan. Bring to a boil, reduce to a simmer and cook for about 5 minutes, then puree using an immersion blender or food processor. Continue to cook over medium-high heat for an additional 10 to 15 minutes or until the mixture is thick and syrupy; the mixture should be thick enough to coat the back of a spoon. Pour the hot fruit mixture onto the prepared baking sheet and spread evenly into approximately an 8 × 12 inch rectangle. Place in the oven and bake for 3 hours. After 3 hours have passed, turn off the oven and allow to sit in the oven overnight. Once completely set, cut into strips with a sharp knife or pizza cutter; roll up in a clean piece of parchment paper. Store in an airtight container for up to 3 weeks. How Does Trump's Policies With School Lunch Compare to Obama's? Sulfites Enhance Flavor and Keep Food Fresh, but Are There Risks? What Is Muscovado Sugar and How Is It Used?